Does Your Mineral Makeup Cover Scars? In most cases of attempting to hide an old or new scar, our mineral powders do an excellent job at concealing them. As always we recommend using a lighter shade of mineral foundation to correct the redness or neutralize the deepening of the skin pigment which accompanies scarring. The reason for not using your correct foundation shade match is sometimes this can actually accentuate the scar tissue by making the spot appear darker than the rest of the face. This is why a lighter shade of mineral makeup foundation helps to reduce the hyper pigmentation of the scar you are trying to conceal. There is a small exception to complete coverage. 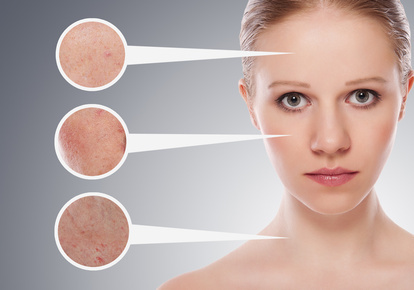 Scarring which may also have a severe indentation may not cover as well, but the appearance will definitely be improved through reduction in redness and softening and blurring of the facial skin. In rare instances, indented scarring due to destruction of collagen as in some acne cases, can be improved. However, the reality is short of caking with most other brands of makeup, whether in mineral or liquid form, the concealment of the dimpling effect won't be perfect and may actually make them more noticeable due to the heaviness of the makeup application. Notwithstanding the problems wearing heavy makeup can cause skin as well. However, with our mineral makeup scars will definitely be less noticeable even by applying our minerals sparingly. Heavy coverage of our mineral makeup can also be used to hide imperfections very well without an unnatural look or caking while keeping skin soft and healthy. One small caveat though, if also dealing with large pores on the face you'll want to balance the level of application to avoid making them appear larger. One can achieve improved coverage also by applying with our "moist method" or by applying a small dab of Jojoba Oil rubbed in well, followed by a light layer of minerals. Depending on the severity of the scar, continue to apply minerals until you reach the desired coverage. Jojoba is not occlusive, so it is very safe to use on the face. For severe scarring, then laser resurfacing may be the only recourse for achieving best results and something which should be discussed with your doctor. Katherine, the owner of Sterling Minerals, just recently had a basal cell carcinoma removed from her temple and the minerals have done an excellent job at making her scar less than noticeable while also soothing the erythema which accompanied the now remaining scar tissue. The appearance improves everyday, but while the healing process continues her mineral makeup works wonders and no one ever knows the scar is there. Getting excellent coverage even works beautifully with our "Delicate" formula. This is the choice she uses daily for her cosmetic needs. She demonstrates the coverage in the video, left. A touch of extra moisturizer or jojoba oil will work wonders for getting the job done while maintaining coverage throughout the day. Using skin healthy gentle mineral makeup is the better choice overall, while giving skin soothing benefits which improve skin color and tone, providing a beautiful new "you" and allowing your natural beauty to shine through.